It is well-known that great teachers make great leaders and because of this, I believe that professional development is extremely important to educators, especially piano teachers. Many private piano teachers work independently and, if the constant effort to network is not made, are at risk of becoming stagnant and experiencing burnout. We need support and mentoring from others, an awareness of new teaching/curriculum resources, information on relevant technology and how it can be applied to our individual teaching situations, and access to the latest research on how the upcoming generation learns best. Although it is evident that professional development is valuable to our mission as piano teachers, it can be difficult to carve out enough time to adequately pursue it, especially if it means traveling, lengthy workshops, and schedule or family conflicts. Limited finances can also prevent teachers from accomplishing their personal goals for professional development. One of my goals for this year was to participate in at least one professional development opportunity. I found one that fit my needs perfectly from Tracy Selle called Piano Teacher Webinar. This two-part webinar is full of information that is relevant for both novice and veteran piano teachers. 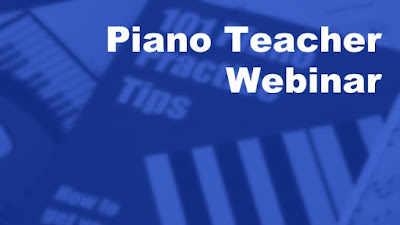 Outside of the video interviews conducted with successful piano teachers from around the world, these webinars include bonus materials such as sheet music, coupons to curriculum resources, teaching worksheets, and much more. So far, I have completed one half of the webinar and was amazed at how much information I was given! I'm planning to finish the webinar when my schedule slows down again in January. I really appreciate that I can fit completing this opportunity in around my schedule and that it was extremely affordable. I highly recommend this webinar to my colleagues who desire inspiration and growth in their professional and personal lives.